Happy Chap Goh Meh! the 15th night of Chinese New Year. It is also known as the Chinese Valentine's Day and marks the end of the Lunar New Year. In places like Penang, the celebration is associated with young single women tossing tangerines into the sea with the hope that their future life partner will pick it up. Not sure if they do it here in Kuching though. We celebrated quite simply with family dinner, fired a few fire crackers and took the boys for a spin around town, watching fire crackers lighting up the city's skyline. The moon is brightest tonight and people are still lighting up the sky with fire crackers as I am typing this. Tomorrow, it is time to go back to life as usual, back to work, back to business and no more long holidays. I didn't manage to make any wire jewelry today but am sharing one that I completed yesterday - a caged turquoise pendant, similar to this one. Used 22ga wire for the wrapping. 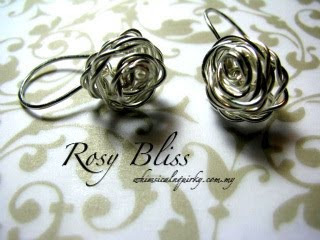 Hey look what M of Whimsicalnquirky came up with - Rosy Bliss based on my Wire Wrapped Rose Earrings Tutorial :) While you are there, do check out her amazing works. Labels: Necklaces | Pendants , Wire Jewelry , z Jewelry Friends n Artists Share it! since i made the earrings, been wearing it everyday because its simple and yet its loud in statement. AND...i got my first order for the rose earrings! thanks for sharing with us!!! Thank you for this beutifull post. I am very impressed by the unique designs. You are very welcome and thank you too.